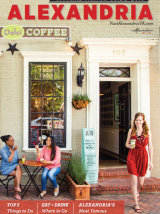 Alexandria, Virginia, encompasses more than 900 acres of parks and dedicated public space. In these green outdoor spaces, families play volleyball by the river, picnic at playgrounds and run with four-legged friends. Joggers, bikers, and hikers traverse the Mount Vernon Trail, part of the Potomac Heritage National Scenic Trail, while nature lovers explore indigenous plants, trees, and flowers at the Winkler Botanical Preserve. Three blocks north of the Torpedo Factory Art Center, Founders Park is a peaceful riverside garden in Old Town Alexandria where the public can stroll along the shore, walk their dogs, play volleyball, have a picnic and enjoy the flowers and greenery of Northern Virginia. Enjoy this dockside park with views of the Woodrow Wilson Bridge and National Harbor. 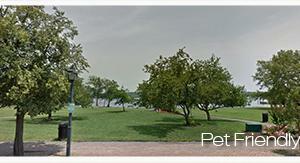 Just south of Old Town Alexandria, Jones Point Park is located on the Potomac River. Its lighthouse, built in 1855, is the last remaining riverine lighthouse in Virginia. Oronoco Bay Park is a popular location for picnicking, walking, biking, and jogging. Festivals and special events are held in the park during the warmer months of the year. Relax in this townhouse-lined park in North Old Town. Tide Lock Park is home to the "Promenade Classique," a neoclassical sculpture among waterfalls and pools by French sculptors Anne and Patrick Poirier. In the heart of Old Town, Waterfront Park is a peaceful respite with a statue of a ship builder, old anchors, and a monument to fallen policemen. With plenty of street parking, Windmill Hill Park is a great place for a family outing. Enjoy the swing set overlooking the river or venture onto the dock with views of the Woodrow Wilson Bridge. Nearly 18 miles long, the Mount Vernon Trail stretches from George Washington&apos;s Mount Vernon Estate in Alexandria alongside the scenic Potomac River to the national monuments and memorials in Washington D.C. A favorite among runners and cyclists, the trail connects other regional trails, including the Potomac Heritage, Custis, Rock Creek, Four Mile Run, and Woodrow Wilson Bridge Trails. With herons, turtles, snakes, frogs, kingfishers and more just a stone&apos;s throw from Old Town, this park marks the site of the first permanent settlement of the city of Alexandria. Early records show that John Alexander purchased a part of the island in 1696. It lies just north of Old Town Alexandria, right off the George Washington Parkway and the Mount Vernon Trail. A 50-acre wildlife sanctuary with a one-mile long nature trail that meanders along streams, wooded hills, and freshwater marshland. 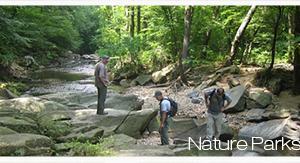 Naturalist-led tours of the park are available upon request for groups of eight or more (reservations required). A self-guided booklet, available at the Jerome "Buddie" Ford Nature Center, interprets the natural features of the park using numbered signposts along the trail. A paved bike trail connecting Sanger Ave. and Van Dorn St. winds through the park which is ADA accessible. At the Nature Center, you can see live animals up close and learn about the cultural and natural history of Dora Kelley Nature Park. The nature center provides year-round programs and exhibits on Alexandria&apos;s human and natural history. For more information, call the nature center at 703-746-5525. Exhibits at Jones Point Park highlight the area&apos;s freshwater marsh habitat, its use by American Indians, and its role in shipbuilding and navigation. The park&apos;s two fishing piers make an excellent spot to cast for American catfish, rock bass, and American eels. A canoe launch offers access to the Potomac River. Formal spaces for recreation include two playgrounds (one for children under age five and one for children ages six to ten) and two basketball courts. More than 44 acres of plants and trees indigenous to the Potomac River Valley have been curated by the Winkler Botanical Preserve, which is managed by a private, non-profit organization with a mission to provide free environmental education for the students of the Alexandria City Public Schools and is open daily for visitors. The preserve also offers popular nature camps in summer and during spring and winter breaks. Admission is free and visitors can enter the preserve through an open gate in a small apartment complex parking lot between 8:30 a.m. and 4:00 p.m. The Carlyle House garden offers a 3/4 acre open green space in the center of Old Town Alexandria for lunch or quiet solitude. Designed in the 18th-century style, the garden features carefully researched plant materials which would have been available to John Carlyle during his occupancy. Brick walks, benches, boxwood parterres, and a lovely cutting garden make the Carlyle House garden a charming respite from the town&apos;s hustle and bustle. Fort Ward Park is the best preserved of the Union forts and batteries built to protect Washington, DC during the American Civil War. 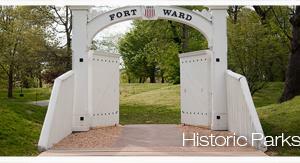 Not only a wonderful, pet-friendly setting for walking, picnics, enjoying the playground and exploring history, Fort Ward is also celebrated for its period-costumed vignettes and weekly concerts at its impressive amphitheater. Jones Point Park is located on the Potomac River, just south of Old Town Alexandria. It was a critical piece of the city of Alexandria&apos;s history as one of the largest centers for shipping, manufacturing, and transportation in the nation. 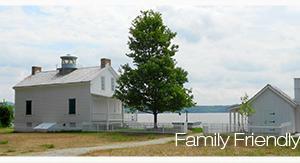 Its lighthouse, built in 1855, is the last remaining riverine lighthouse in Virginia. Jones Point Park contains the southernmost boundary marker of the original boundary of the District of Columbia planned by George Washington and Benjamin Banneker. Exhibits at Jones Point Park highlight the area&apos;s freshwater marsh habitat, its use by American Indians, and its role in shipbuilding and navigation. People who come to Alexandria on Saturday mornings find themselves in a busy plaza where local farmers and artists have been selling their products since 1753. Old Town Alexandria&apos;s Market Square is thought to be one of the nation&apos;s oldest continually operating farmer&apos;s markets, serving as a primary way Alexandria residents have typically obtained their meat, dairy, fish, fruits, and vegetables. George Washington sent his produce from Mount Vernon to be sold at the Farmer&apos;s Market. Today, the market offers Alexandrians a way to reconnect to the past, while participating in an ongoing local and national tradition. Tide Lock Park is named for an old canal controlled by wooden locks that once existed on the Alexandria Waterfront. The canal was used to move goods and materials to and from sea-going ships. The last of Alexandria canals were destroyed by flood in the early 1820&apos;s and never replaced due to the establishment of the railroad. Today, there is a replica of the lock and canal in the Park, which includes many of original canal wall stones. First established as a park in 1945, Windmill Hill Park sits on former marshland that was filled in the 19th century. Its name comes from the wind-powered water mill that occupied the sandy bluff in 1843. 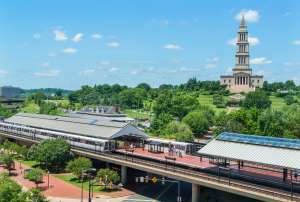 Three blocks north of the Torpedo Factory Art Center, Founders Park is a peaceful riverside garden in Old Town Alexandria where the public can stroll along the shore, walk their dogs, play volleyball, have a picnic and enjoy the flowers and greenery of NorthernVirginia. Conveniently located between several of Alexandria&apos;s pet-friendly hotels, Montgomery Park is a beautiful green space with an off-leash dog run. With plenty of street parking, Windmill Hill Park is a great place for the entire family. As your pet plays in the off leash pet area, your children can enjoy the swing set overlooking the river or venture onto the dock with views of the Woodrow Wilson Bridge. Two blocks south of Old Town&apos;s Market Square, this urban oasis known by locals as the Tot Lot is a favorite for locals and tourists. Home of Alexandria&apos;s West End Farmers Market on Sundays at 9 a.m. - 1 p.m, May through November 20, Ben Brenman Park, offers a wide variety of recreation activities. Park Rangers offer Learn to Ride and Lighthouse Life, two kid-friendly programs at Jones Point Park.